Beautiful antique furniture, big fluffy robes, extravagant breakfasts and intimate settings are what most people bring to mind when thinking of bed and breakfast inns. Handmade doggie treats, however, is one luxurious amenity that one would not normally include. The truth is that more and more inns are accepting, as well as pampering four legged guests. Here is some information about how you and your pet can have a relaxing stay at a bed and breakfast. If you decide to take your pet with you to stay at a bed and breakfast, it is important to plan your itinerary around them. It is key to book accommodations that are pet friendly. 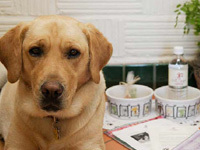 Visit PetsWelcome at BnBFinder.com, which lists more than 400 pet friendly inns in 300 cities around the country. With so many to choose from it is easy to find the perfect bed and breakfast for you and your pet. When booking, tell the innkeeper that you want to bring your pet. Some inns have policies regarding the size, weight, and type of pet that they can accommodate. Make sure you find out if the innkeeper requires any special deposits or extra fees to cover your pet's stay. Also, find out if there are animals that live at the inn to avoid any potential problems for your pet. Ask about designated rooms for people staying with their furry friends. These rooms are often located on the ground floor for easier access. Upon arrival remind the innkeeper that you are traveling with a special guest. Some inns provide a goody bag for pets that include treats, pick up bags, and information on local veterinarians and pet friendly establishments. Ask if there are any restricted or designated places for pets both indoors and outdoors. Check with the innkeeper about walking your pet through the gardens, along the shore, or on trails. This way, you and your pet can take in the lovely atmospheres that help make bed and breakfasts so special. As you will see when you get to your room, innkeepers put a great deal of effort in maintaining a beautiful, immaculate house, and it is your responsibility to keep it that way. Wipe your pet's paws every time he comes in from outside. Discourage him from sleeping on the furniture and cover all furniture and the beds he might go on. Many inns provide special sheets, towels, and beds for your pet so that he too can relax in comfort. Put fresh water and food on a mat if you are feeding in the room and try to keep your pet on the same feeding schedule you would at home. Some inns will even provide him with fancy crystal dishes and homemade food and treats to let him know how pampered he truly is. When you leave your room, don't leave your pet behind. Most bed and breakfasts have policies against leaving your pet unattended. Crate your pet to avoid any unwanted situations if you are permitted to leave him in the room, and be sure that all employees of the inn know that your pet will be in there. Some inns offer in-room pet sitting services, as well as doggie daycare areas that allow your pet to play while you are off premises. When outdoors, keep your pet on a leash and always clean up after him. Respect all the guests at the inn and their feelings about animals. At the end of your stay at the inn, inspect your room for any damage your pet may have caused. Notify the innkeeper and vol-unteer to pay for any repairs. Pet friendly inns know that some-times an accident may happen and would prefer you to let them know as soon as possible so that they can deal with it accordingly. Doesn't it sound nice to be able to go on a relaxing, intimate vacation and be able to bring your pet along? Many bed and breakfast innkeepers have said that some of their most memorable guests are pets and their owners. Hopefully your visit at the bed and breakfast will be just as memorable. Below are some accomadating bed and breakfasts that love to pamper you and your pets too! The lodge is noted for being an extremely dog-friendly place to stay and offers many special amenities for your pet. Several designated main level King suites especially for guests visiting with dog companions. Throw blanket, extra towels, a comfortable sleeping cot and water bowl. Canine goodie bag at check-in. At Collingwood Inn, pets (and owners) are always welcome. Being the premier inn in Ferndale with pet-friendly rooms, they strive to please their four-legged guests as much as their two-legged ones! Designated rooms where pets are welcome. Water and food dishes, blankets, clean up bags, and a "welcome treat". The Lazy L is a pet friendly resort with a creek that dogs love. They welcome well-mannered, housebroken dogs to come enjoy all they have to offer. Large fenced in area for running, exercise and off-leash play. The innkeepers understand how wonderful it is to bring the family pet on vacation, as they have in the past, and this is why they allow guests to bring small dogs. Information on vets very close by, and areas you can walk the dogs- beaches and pet friendly parks. Does not charge a fee for bringing your canine family member. Designated rooms for dogs and their owners. You and your dog can enjoy this unique combination of a classic Cape Cod Inn with the spirit of a small luxury hotel. Provides special sheets and towels for your dog. Offers 4 beautiful acres for your furry friend to explore.